I’m pretty sure that’s what my death certificate will read. My house is surrounded by oak trees which are bold and beautiful and give me much-appreciated privacy and shade throughout the summer months. Unfortunately, the joy of them fades in autumn when the acorns they produce become my enemy number one and a threat to my physical wellbeing. So far this year I have been practically pounded mindless by random acorns falling that have clearly identified my head as their target. 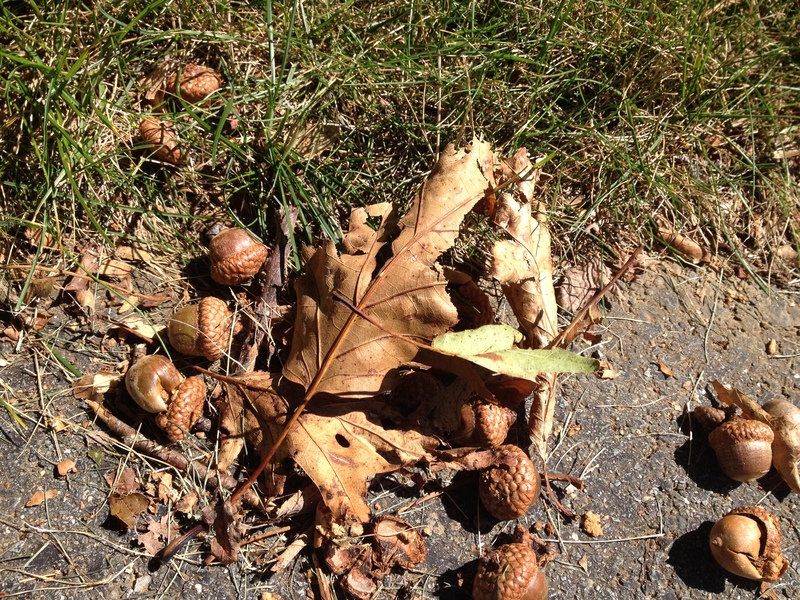 Don’t be fooled – acorns may be small but they hurt when falling 40 feet onto your skull. I couldn’t dare invite anyone into my backyard without first offering them a hardhat for protection. Then comes the endless hours spent scooping the acorns off my lawn each year that would be better spent writing or spending time with family. I think the local squirrels really need to pick it up a notch as their productivity levels in terms of acorn gathering seems to be low. So how will they actually kill me? Based on several near-misses I am going to predict that one of these days I’m going to trip on them, fall backwards, and crack my head on the pavement. I already have taken a rather embarrassing tumble down my driveway this year because I stepped on a clump of them, rolled my ankle, lost my balance, and went flying down my driveway. Serious injury or possible death seem likely. Wish me luck! This entry was tagged acorns, fall. Bookmark the permalink. That’s funny. I just want to say you’re an inspiration, how far you have gone, how diligent you have been and how professional. Thanks. Thanks and best of luck on your new release. I’m sure you will be an inspiration to others yourself!